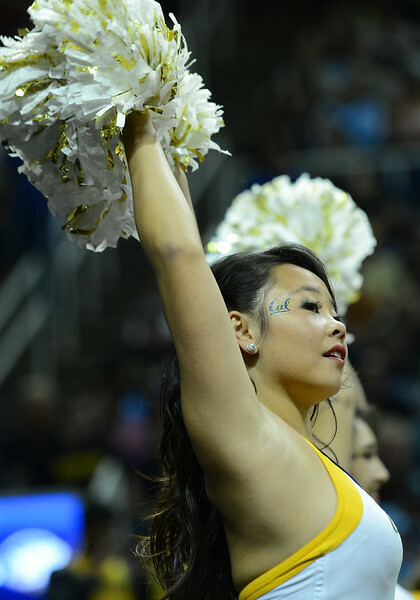 March 23, 2013: A California Golden Bears cheerleader performs during a game between the Syracuse Orange and the California Golden Bears in the third round of the NCAA Division I Men's Basketball Championship at HP Pavilion in San Jose, California. 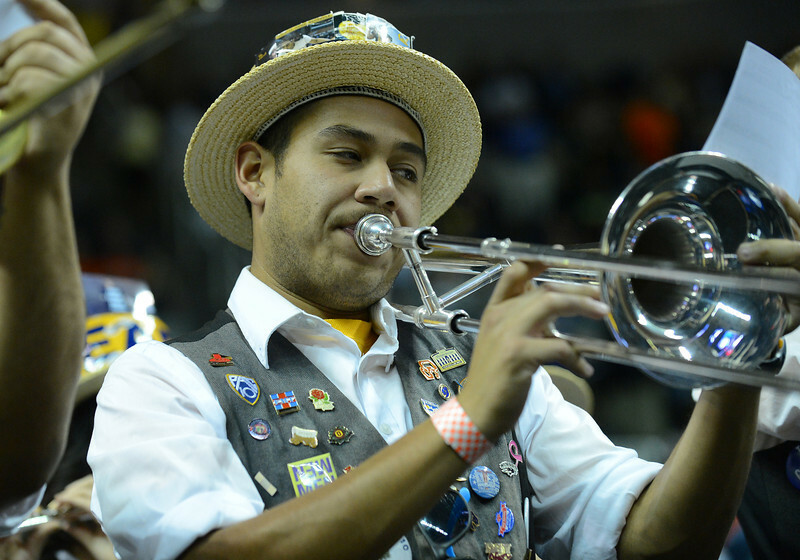 March 23, 2013: A member of the California Golden Bears band performs during a game between the Syracuse Orange and the California Golden Bears in the third round of the NCAA Division I Men's Basketball Championship at HP Pavilion in San Jose, California. March 23, 2013: Syracuse Orange cheerleaders perform during a game between the Syracuse Orange and the California Golden Bears in the third round of the NCAA Division I Men's Basketball Championship at HP Pavilion in San Jose, California. March 23, 2013: A California Golden Bears cheerleader performs in a timeout during a game between the Syracuse Orange and the California Golden Bears in the third round of the NCAA Division I Men's Basketball Championship at HP Pavilion in San Jose, California. 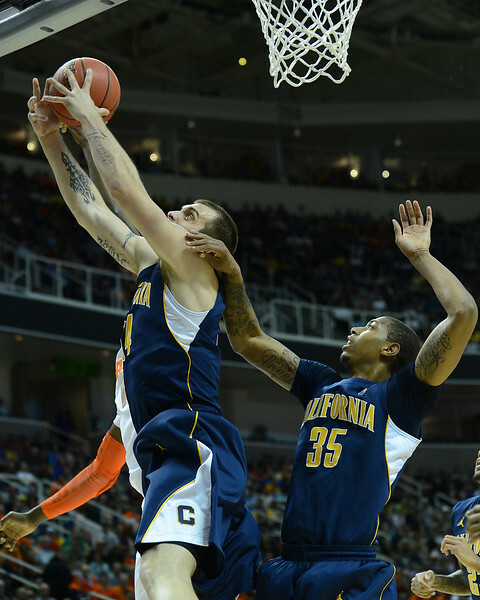 March 23, 2013: California Golden Bears forward Richard Solomon (35) puts up a shot near the rim during a game between the Syracuse Orange and the California Golden Bears in the third round of the NCAA Division I Men's Basketball Championship at HP Pavilion in San Jose, California. 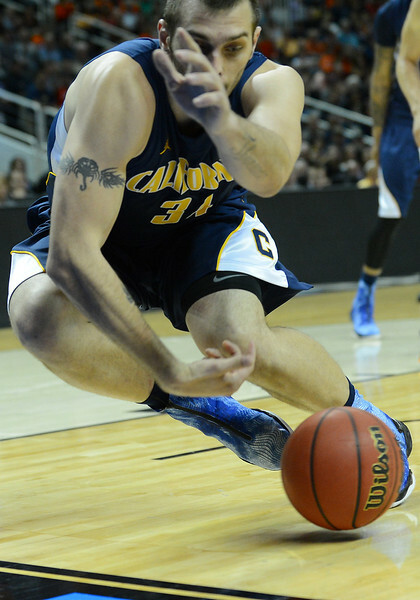 March 23, 2013: California Golden Bears forward Richard Solomon (35) jumps for the tipoff during a game between the Syracuse Orange and the California Golden Bears in the third round of the NCAA Division I Men's Basketball Championship at HP Pavilion in San Jose, California. 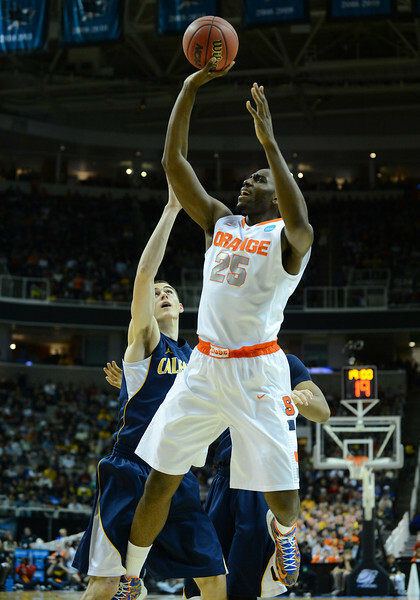 March 23, 2013: Syracuse Orange forward Rakeem Christmas (25) puts up a shot during a game between the Syracuse Orange and the California Golden Bears in the third round of the NCAA Division I Men's Basketball Championship at HP Pavilion in San Jose, California. 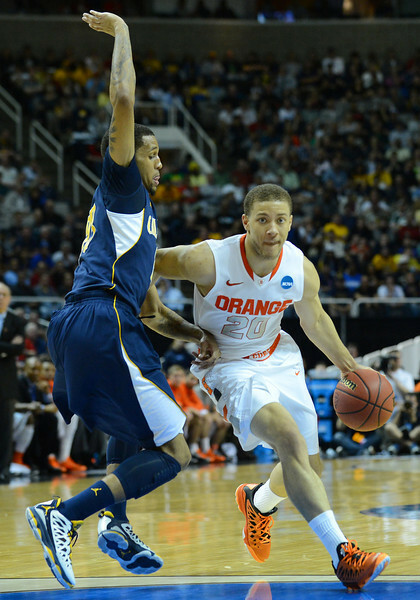 March 23, 2013: Syracuse Orange forward C.J. Fair (5) drives to the basket during a game between the Syracuse Orange and the California Golden Bears in the third round of the NCAA Division I Men's Basketball Championship at HP Pavilion in San Jose, California. March 23, 2013: Syracuse Orange guard Michael Carter-Williams (1) calls out a play during a game between the Syracuse Orange and the California Golden Bears in the third round of the NCAA Division I Men's Basketball Championship at HP Pavilion in San Jose, California. 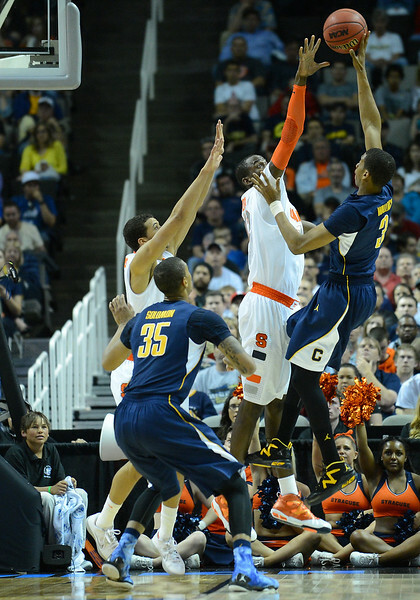 March 23, 2013: Syracuse Orange forward C.J. 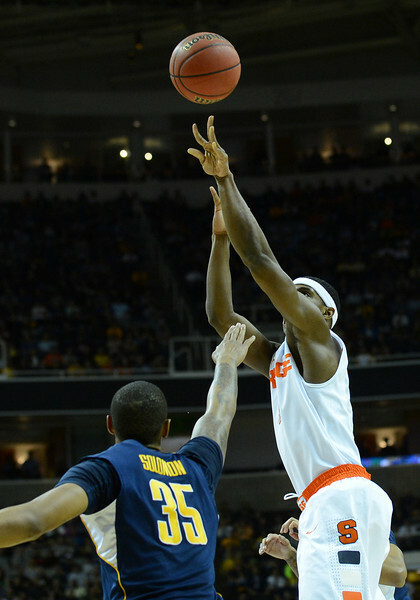 Fair (5) puts up a shot during a game between the Syracuse Orange and the California Golden Bears in the third round of the NCAA Division I Men's Basketball Championship at HP Pavilion in San Jose, California. 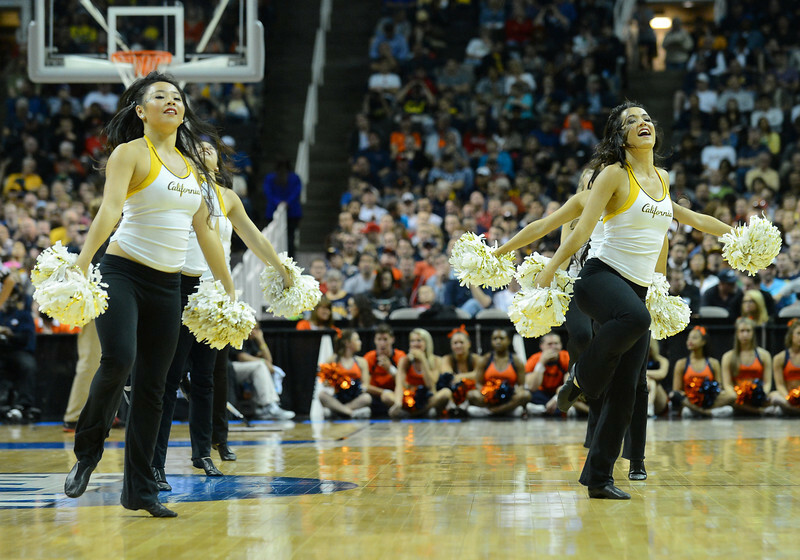 March 23, 2013: California Golden Bears cheerleaders perform in a timeout during a game between the Syracuse Orange and the California Golden Bears in the third round of the NCAA Division I Men's Basketball Championship at HP Pavilion in San Jose, California. 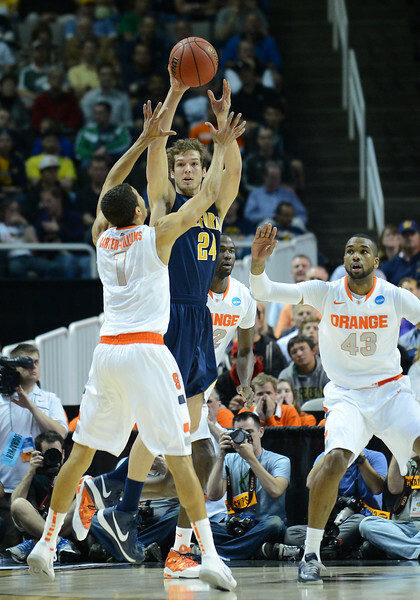 March 23, 2013: California Golden Bears guard Ricky Kreklow (24) passes the ball over the defense during a game between the Syracuse Orange and the California Golden Bears in the third round of the NCAA Division I Men's Basketball Championship at HP Pavilion in San Jose, California. 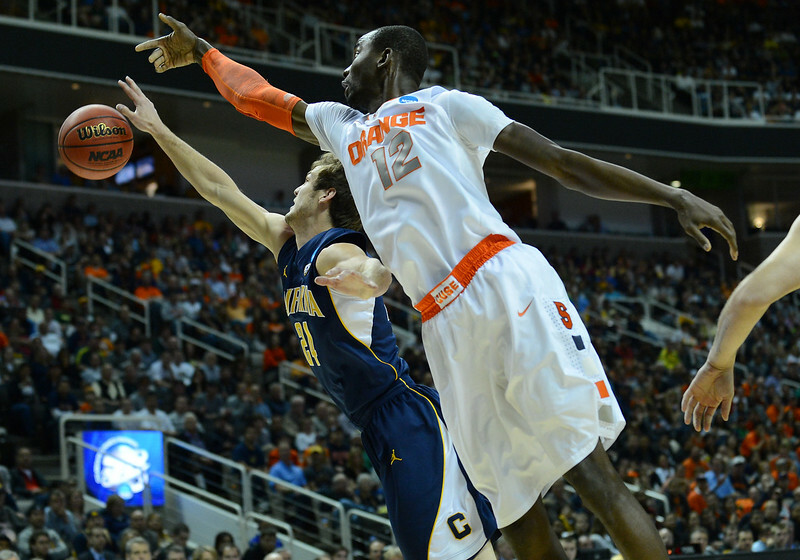 March 23, 2013: Syracuse Orange forward C.J. 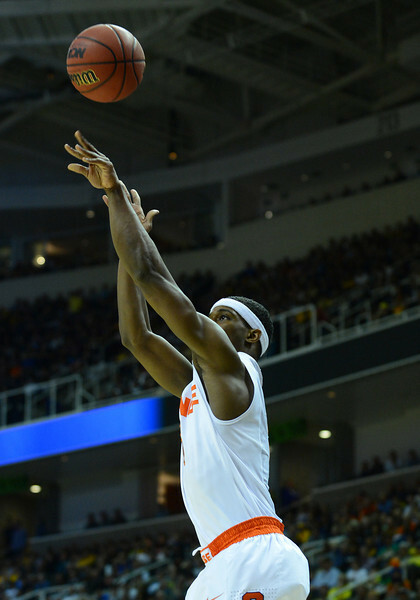 Fair (5) takes a shot during a game between the Syracuse Orange and the California Golden Bears in the third round of the NCAA Division I Men's Basketball Championship at HP Pavilion in San Jose, California. 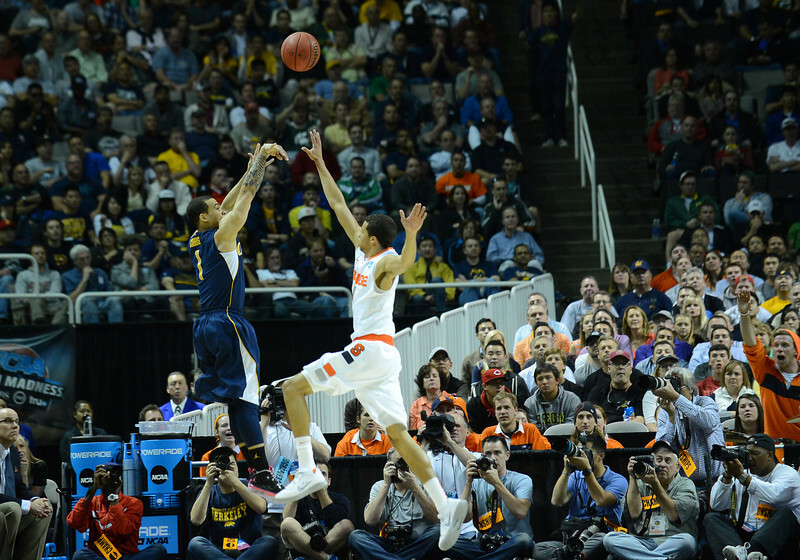 March 23, 2013: California Golden Bears guard Justin Cobbs (1) takes a shot over the defense of Syracuse Orange guard Michael Carter-Williams (1) during a game between the Syracuse Orange and the California Golden Bears in the third round of the NCAA Division I Men's Basketball Championship at HP Pavilion in San Jose, California. 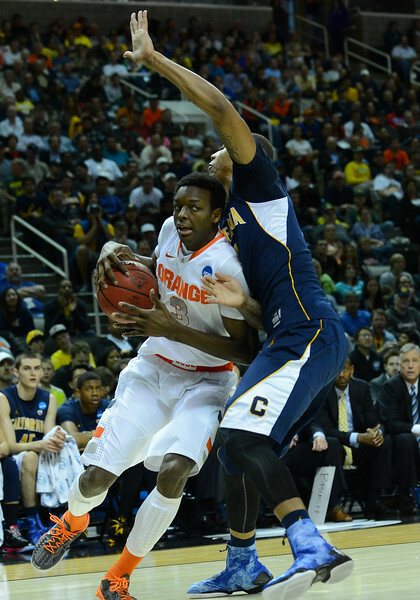 March 23, 2013: Syracuse Orange forward C.J. Fair (5) takes a shot over California Golden Bears forward Richard Solomon (35) during a game between the Syracuse Orange and the California Golden Bears in the third round of the NCAA Division I Men's Basketball Championship at HP Pavilion in San Jose, California. 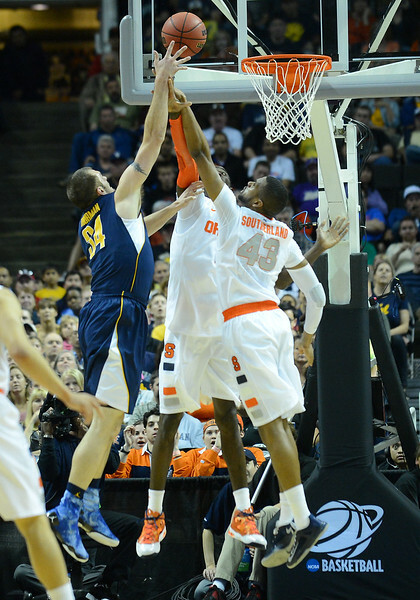 March 23, 2013: California Golden Bears guard Ricky Kreklow (24) and Syracuse Orange center Baye Keita (12) battle for a rebound during a game between the Syracuse Orange and the California Golden Bears in the third round of the NCAA Division I Men's Basketball Championship at HP Pavilion in San Jose, California. 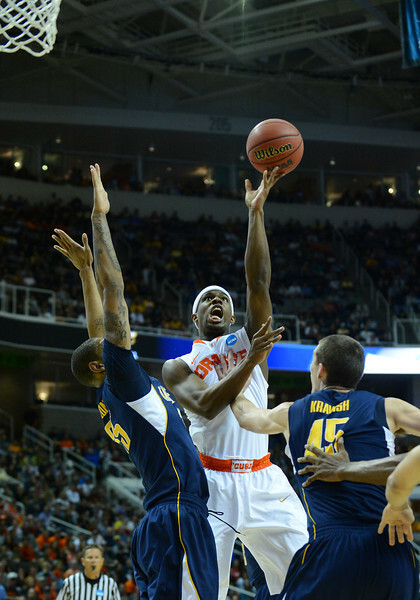 March 23, 2013: Syracuse Orange forward Jerami Grant (3) drives the baseline during a game between the Syracuse Orange and the California Golden Bears in the third round of the NCAA Division I Men's Basketball Championship at HP Pavilion in San Jose, California. 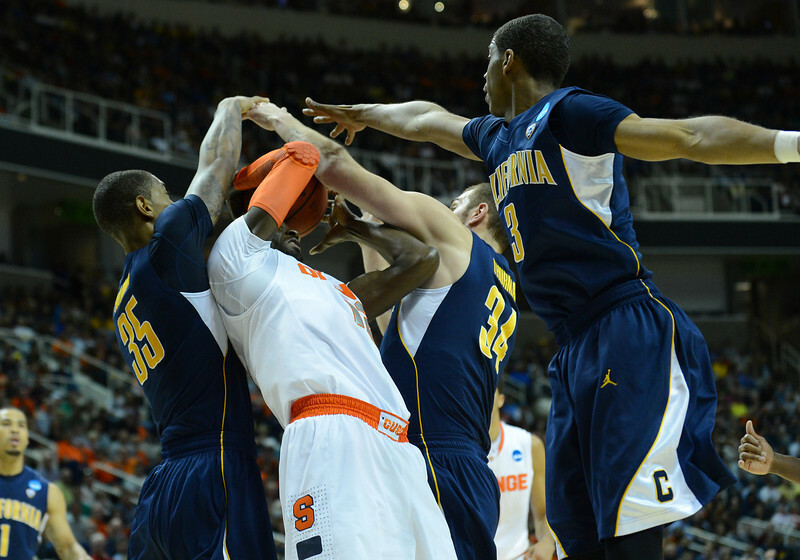 March 23, 2013: California Golden Bears forward Robert Thurman (34) tries to save a ball from going out of bounds during a game between the Syracuse Orange and the California Golden Bears in the third round of the NCAA Division I Men's Basketball Championship at HP Pavilion in San Jose, California. March 23, 2013: Syracuse Orange cheerleaders perform in a timeout during a game between the Syracuse Orange and the California Golden Bears in the third round of the NCAA Division I Men's Basketball Championship at HP Pavilion in San Jose, California. 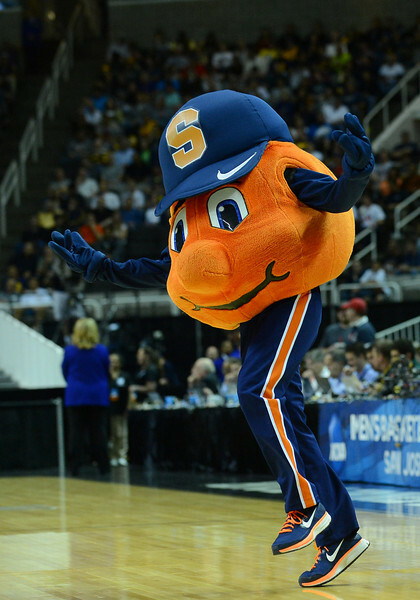 March 23, 2013: The Syracuse Orange mascot performs in a timeout during a game between the Syracuse Orange and the California Golden Bears in the third round of the NCAA Division I Men's Basketball Championship at HP Pavilion in San Jose, California. 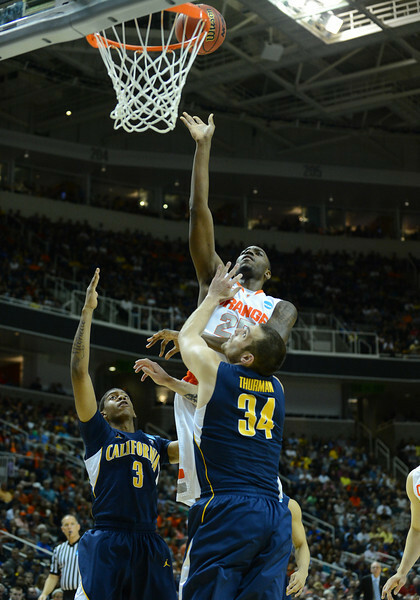 March 23, 2013: California Golden Bears forward Robert Thurman (34) tries to dunk during a game between the Syracuse Orange and the California Golden Bears in the third round of the NCAA Division I Men's Basketball Championship at HP Pavilion in San Jose, California. 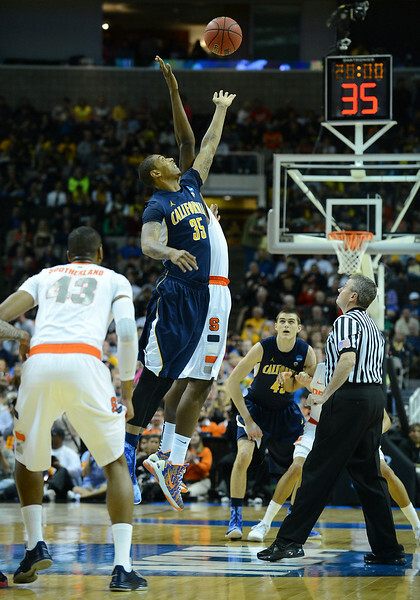 March 23, 2013: California Golden Bears forward Robert Thurman (34) puts up a shot against the Syracuse Orange defense during a game between the Syracuse Orange and the California Golden Bears in the third round of the NCAA Division I Men's Basketball Championship at HP Pavilion in San Jose, California. 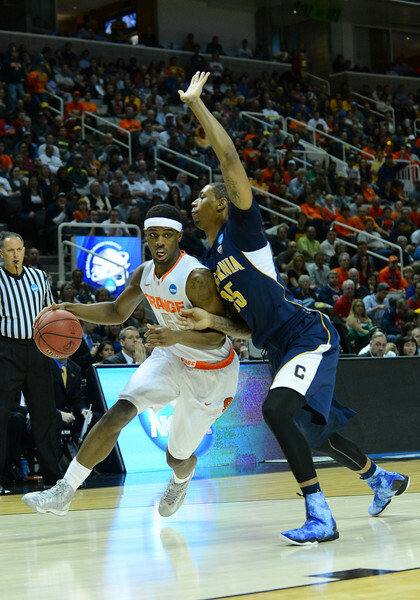 March 23, 2013: Syracuse Orange guard Brandon Triche (20) drives to the basket during a game between the Syracuse Orange and the California Golden Bears in the third round of the NCAA Division I Men's Basketball Championship at HP Pavilion in San Jose, California. 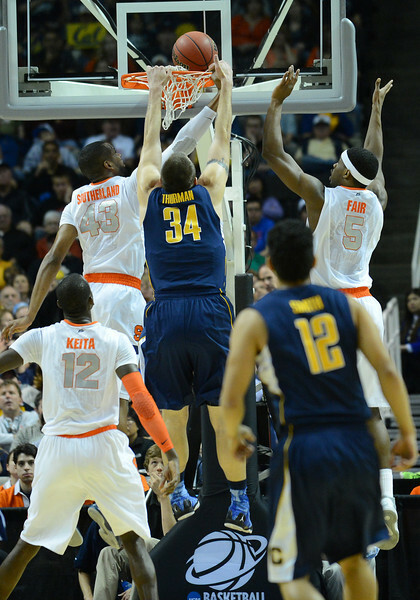 March 23, 2013: California Golden Bears forward Robert Thurman (34) grabs a rebound during a game between the Syracuse Orange and the California Golden Bears in the third round of the NCAA Division I Men's Basketball Championship at HP Pavilion in San Jose, California. March 23, 2013: A Syracuse Orange cheerleader performs in a timeout during a game between the Syracuse Orange and the California Golden Bears in the third round of the NCAA Division I Men's Basketball Championship at HP Pavilion in San Jose, California. 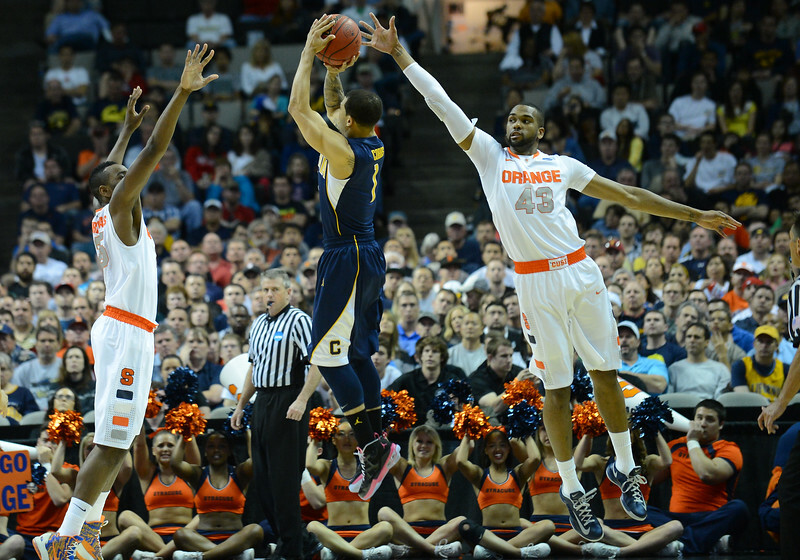 March 23, 2013: California Golden Bears guard Justin Cobbs (1) shoots a three point shot during a game between the Syracuse Orange and the California Golden Bears in the third round of the NCAA Division I Men's Basketball Championship at HP Pavilion in San Jose, California. March 23, 2013: California Golden Bears guard Justin Cobbs (1) and Syracuse Orange guard Michael Carter-Williams (1) battle for a loose ball during a game between the Syracuse Orange and the California Golden Bears in the third round of the NCAA Division I Men's Basketball Championship at HP Pavilion in San Jose, California. 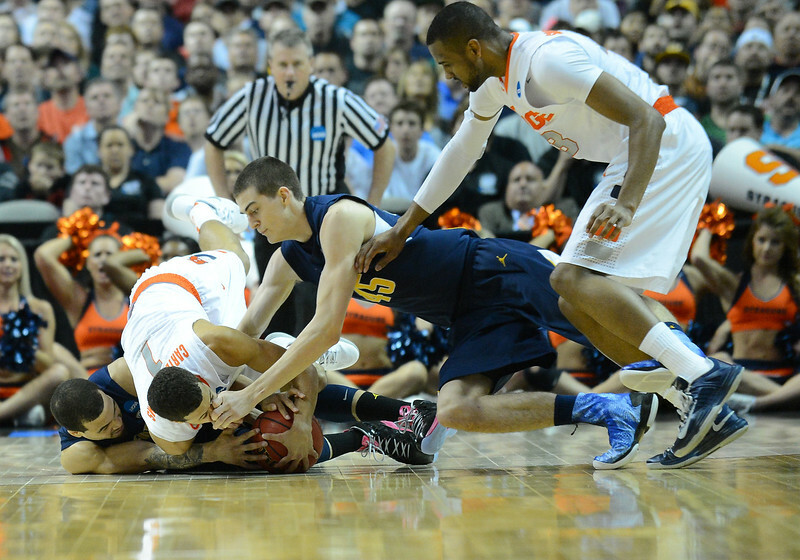 March 23, 2013: Syracuse Orange and California Golden Bears players battle for a loose ball during a game between the Syracuse Orange and the California Golden Bears in the third round of the NCAA Division I Men's Basketball Championship at HP Pavilion in San Jose, California. 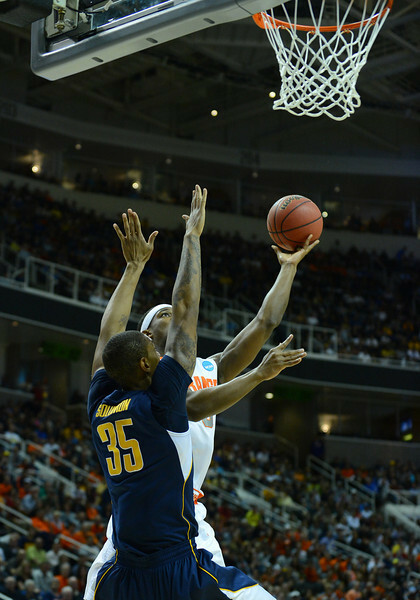 March 23, 2013: California Golden Bears guard Tyrone Wallace (3) puts up a shot during a game between the Syracuse Orange and the California Golden Bears in the third round of the NCAA Division I Men's Basketball Championship at HP Pavilion in San Jose, California. March 23, 2013: Syracuse Orange guard Michael Carter-Williams (1) drives past California Golden Bears guard Tyrone Wallace (3) during a game between the Syracuse Orange and the California Golden Bears in the third round of the NCAA Division I Men's Basketball Championship at HP Pavilion in San Jose, California. March 23, 2013: Syracuse Orange guard Michael Carter-Williams (1) gets a layup during a game between the Syracuse Orange and the California Golden Bears in the third round of the NCAA Division I Men's Basketball Championship at HP Pavilion in San Jose, California. 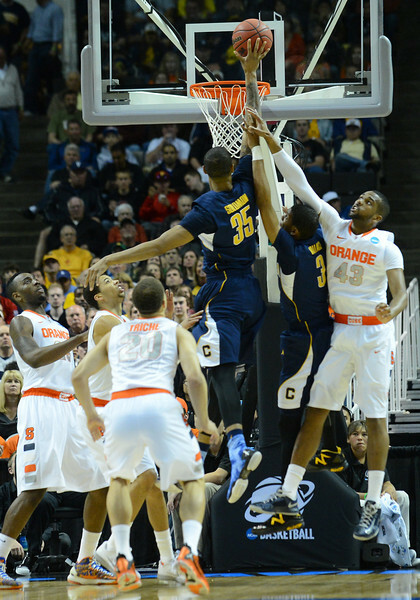 March 23, 2013: A Syracuse Orange player battles for a rebound during a game between the Syracuse Orange and the California Golden Bears in the third round of the NCAA Division I Men's Basketball Championship at HP Pavilion in San Jose, California.